All the best holiday wishes to my friends here at the 8 mm forum. All the best to my forum friends and a wonderful week to those who celebrate things in it. Anyone going to run the superb 400ft MGM digest of Easter Parade? Yes indeed hoppy sorry happy Easter. Shall be playing the Ukulele in Church this Easter Sunday and projecting Where Jesus Walked, The Robe and finally Easter Parade. A good film Paul. I only have the 200ft extract but nay tun that with the on & Jerry cartoon Happy Go Ducky (Scope) where the Easter Bunny leaves a duck egg for them.
" HE HAS RISEN LETS REJOICE!! My best to all! " A Happy Easter to all from Rhiwbina, Cardiff. I wish I knew how to post photos! Happy Easter to everyone on the forum. I hope everybunny has a good day. Ha! That was a good joke! 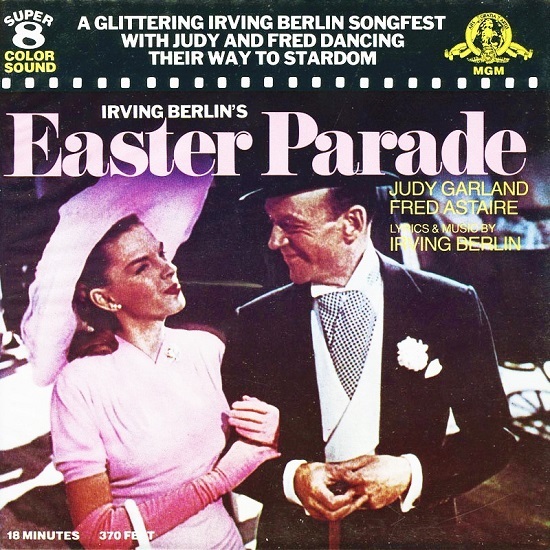 Easter Parade is my choice for next year, as it was recently screened. This Easter will be Ben Hur scope full feature.